In some places of China, Qingming festival is also called "Cold Food Day". Traditionally on this day, people did not use fire and only ate cold food. And, sweet green rice balls are a type of cold food people often eat on this day. The food is especially popular in east China. 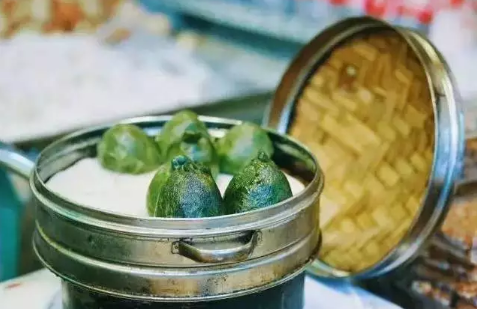 Sweet green rice balls are a popular Qingming food in China's eastern provinces like Jiangsu and Zhejiang. They are made of a mixture of glutinous rice flour and green plant juice, and stuffed with sweetened bean paste. A green plant called mugwort, or "Ai Qing" in Chinese, is what brings the color to the delicacy. This time of year is when the plant has just jumped out of the earth and is at its finest. Sweet green rice balls are a popular Qingming food in China's eastern provinces like Jiangsu and Zhejiang. They are made of a mixture of glutinous rice flour and green plant juice, and stuffed with sweetened bean paste. With some soda added to the water, the plant is boiled into a state of paste. Normal rice flour is mixed into glutinous rice flour to make the rice ball sticky, but not too soft to be shaped. Next, the liquid is poured into the powder. This rice dough is then kneaded into little green balls. The green rice balls can have various fillings, most traditionally being sesame or bean paste. But nowadays some people also make ones filled with pork meat, pickled vegetables and bamboo shoots. After steaming for about twenty minutes, the dumplings are done and give off a nice earthy fragrance. Dating back to the Tang dynasty, the sweet green rice balls have been around for some 1000 years. Originally a food to sacrifice to ancestors, they have gradually become a dish of the season. For people who leave their hometowns for work elsewhere, the sweet green rice balls are a delicacy reminding them of home. For many, Qingming festival also means a spring outing. During the holiday, tourists can appreciate the Water-Releasing Festival in the city of Dujiangyan in Sichuan province. The festival celebrates one of the world's oldest irrigation system. Two old-fashioned trams have now been opened in Jinan, Shandong province, for tourists. Boarding the tram, visitors will find they are surrounded by vintage photos showing the city's history. Both the driver and the steward are dressed in costumes from a century ago, a time when the tram was normally found throughout the city.